Hold on tight! | A Cat Called Freya, and Teego Too! Quick! if we interlock our paws tightly, then when the sky falls, or there’s an earthquake, or worst of all – someone tries to split us up, we’ll be ok! 32 comments to Hold on tight! Nobuddy could ever split you two up! Oh you two are so sweet together! What pretty kitties you are!! And your furs go so well together. Snuggle tight foreverz!!! Oh the two of you are so cute together! It is great that you are holding on to each other too – just in case anything happens! How pawsome is that! You two are amazing! You are the perfect pair. Such togetherness! It’s truly an insPURRation! Not to mention cute as can be. you two are just so cute!! You two are so cute together. We hope no one is thinking about splitting you two sweeties up! Surely no one would try to separate the two of you! Oh you two are so cute! No way anyone could get between you!! Aw, you two are so sweet! Who would even think about separating you? 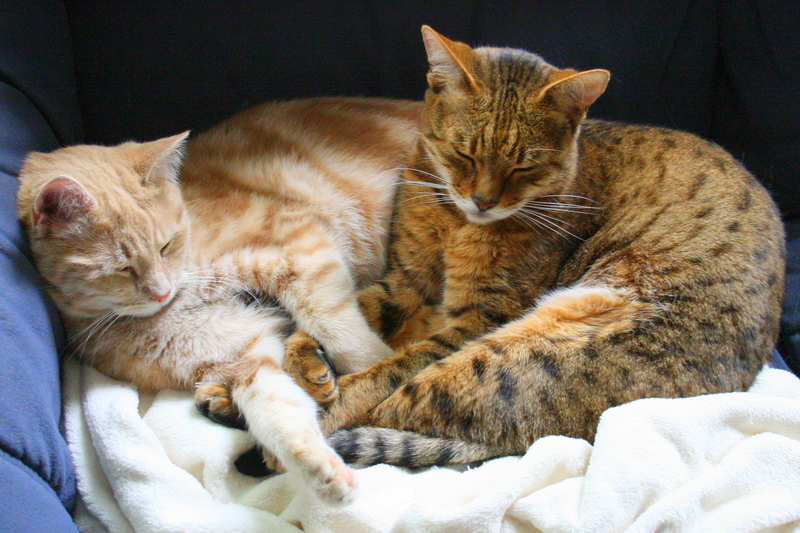 I have a brown spotted male bengal who is identical to Freya, & a female cinammon snow marble bengal who is identical to Teego (except she has light blue eyes). Is Teego a bengal? This is just so sweet. thankyou for coming by and leaving get well wishes when I was injured. I am very much better now. Please come again and play with me in my garden. That picture is so very sweet. We have added you to our blog! arghhhhhh soo cute whish i could just hug you both! !